It’s a shocking statistic. There are over 18,000 children registered as disabled in Albania, but around 15,000 –that is, over 80 per cent–receive no education at all (Unicef, 2014). During nearly 50 years of extreme communism, Albania existed in self-imposed isolation and extreme poverty. Since the fall of the communist regime in the early 1990s, successive governments have been modernising apace. However, the economy is still weak, and when scarce health and education resources are allocated, children with disabilities are a very low priority. Two factors contribute to this negligence. First, negative attitudes in Albania towards all kinds of disability or sensory impairment had previously been deeply embedded in the culture; as elsewhere in the Balkans, lack of exposure and prejudice still lead many to regard disability as a matter of stigma and shame, even divine punishment. Secondly, the years of isolation under communism seem to have left a lack of knowledge professionally; at a number of levels in healthcare and education, some staff lack important training. OM would like to see caretakers of people with special needs being trained more so that these precious people can fulfil their potential to develop and to know that they can make a valuable contribution to society. OM desires that both sides (caretakers and those with disabilities) would grow in their belief that they are uniquely valuable as individuals and loved by God. There are only six special schools in the whole country, offering 700 places (Unicef, 2014). For most families with a disabled child, therefore, the only help they get from the state is a modest monthly allowance from social services—no occupational therapy or physiotherapy, no adaptive aids or technologies. Lack of disabled access to buildings can leave children housebound. Families struggle on alone, doing the best they can to care for their children but hindered by the same lack of training, and perhaps vision, that has thus far affected the rest of society. Other children within the family unit are affected, too; the academic success for those in the Albanian public education system depends on students being able to do the majority of studying as homework, with parental assistance. But when that parent is totally absorbed in the care of a disabled sibling, brothers and sisters often lack essential support and encouragement and fail to reach their own potentials. In one major city, OM partners with a local evangelical church to shine God’s love into this difficult situation by supporting isolated families. Key strategies include a weekly outreach event called Sweet Mess (Rrëmujë e ëmbël in Albanian), which is hosted by the church and OMers for now 10 local families with a special needs family member. Equally important are the home visits to these families, which the church and OM make during the rest of the week. The holistic activities and care are tailored to the situation of the individual family; a visit could include providing some educational input for the disabled child, supporting parents with a listening ear and practical help and helping siblings with that all-important homework. Based on the messy-church concept, whole families come to Sweet Mess—the child with disabilities, a parent and their siblings. Sweet Mess is full of fun, crafts, a puppet, Bible stories, prayer, songs and dramas, along with a tasty meal for all to share. The event is a rare opportunity for these families—an oasis from the culture that defines and limits their daily lives. Here they can feel loved by God and His people, valued, equal. Sixteen-year-old Arben* is a regular attendee at Sweet Mess. He has special needs and is also physically disabled—paralysed and in a wheelchair. His entire life has been in a small, cold, run-down house, along with his recently widowed mother, sister and two brothers. He has never been to school. Someone from the church invited Arben’s mother to bring all the children to Sweet Mess, so members of the OM team started to drive out each week to help Arben out of his house and into the OM car, along with his mother and siblings, for the ride to church. “He adores coming; it’s the highlight of his week!” shares OM Albania team member, Lisi*, from Austria. Arben has a younger brother called Edon*, who was getting behind with his schoolwork, so Sidorela*, an Albanian who heads up the ministry, started making home visits to help him with his studies. Arben made it clear that he also wanted to learn, so Lisi started to come to the house as well, to focus on Arben. She learnt to understand his way of speaking and began trying to teach him the numbers one to six. Initially, Lisi brought a big bag of toys with her every time, which Arben was always very excited about, but then she also brought stamps with numbers and different shapes. Though Arben is able to hold a pencil, he is not able to direct it due to the lack of control in his hands. But grasping the stamps, he is able, for the first time in his life, to “write” the numbers himself and to ‘draw’ a picture. Arben’s brother, Edon, is one of five boys, siblings of several of the disabled kids, for whom Menno*, an OM worker from The Netherlands, has organised a few special group activities or outings, which included taking them to a football match at the city stadium. One of these boys is 17-year-old Dritan*, who would love to become a graphic/web designer. When a team organised by OM Portugal came to visit OM Albania in the spring, Sidorela planned to take three of the Portuguese team members to visit a particular family. But last-minute changes meant Sidorela took them to Dritan’s family instead. As Gonçalo*, one of the Portuguese visitors, later commented, this proved a real “God-incidence” for him and Dritan because Gonçalo is a web designer himself. In their non-native tongue of English, the two young men could talk about their interest in design. How amazing that Gonçalo could meet Dritan and share how he had choosen his career path, encouraging Dritan to pursue his dream. 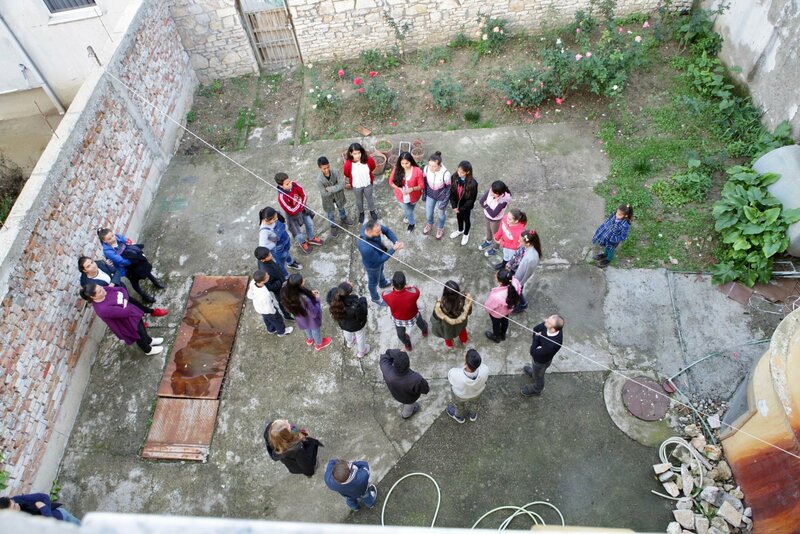 Sidorela has also become closely involved in the situation of a poor Roma family. The mother Anita* has two daughters and a son who come to Sweet Mess. The older daughter is called Tatjana*, aged about twelve. However, at the age when she might have started school, Tatjana’s parents brought her along to beg instead, so she missed five or six years of education. The family found it easier to beg and receive money because their younger daughter, Elira*, who is seven years old, has one leg shorter than the other due to a childhood accident, making walking difficult. Two of the aspects of the special needs ministry that Sidorela particularly enjoys is seeing families’ lives changed in holistic ways—spiritually, emotionally and practically—and having the opportunity to interact and build relationships with the families she meets. Sidorela anticipates that more therapeutic input can be provided by two new colleagues with professional skills and experience who joined the OM team in early 2018. Both have finished their initial language study and are involved in the weekly activities. Anna* is a special needs educationalist from Germany, and Deasy* is a music therapist from Indonesia. The need in Albania is great, since for every disabled child and family which OM works with, there are so many more struggling alone to survive. If you have relevant skills and experience in therapy or teaching, and a heart for the most forgotten, please ask God how He wants you to respond, because OM Albania has a place for you. For God’s enabling as Deasy and Anna start using their professional skills in a new culture with a difficult language; for the patience and persistence to build trusting relationships with the staff at the state centre for special needs people; pray also for the staff to be open to learning new ways of helping the children and young people develop. For grace and wisdom as the team plans and runs homework and development programmes for the kids with disabilities and their siblings like Tatjana and Edon—may these youngsters fully grasp the opportunities and fulfil their potentials. For sufficient staffing and funding to keep running Sweet Mess every week and to purchase much-needed therapy equipment and resources for the young people with disabilities. For the hearts of every family member to respond to the love of Jesus, as they see it lived out through the week in the actions and attitudes of OMers and members of the local church.